Zang M. & Li X.J. (eds). 2011. 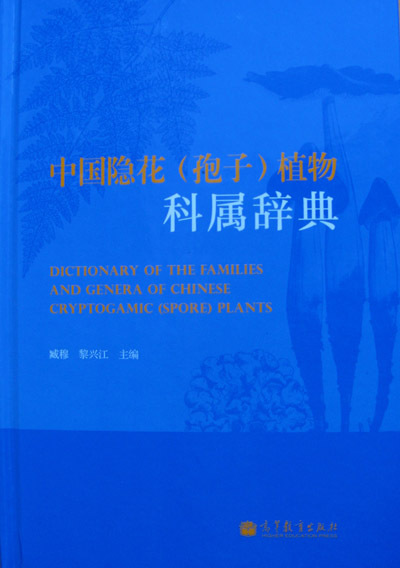 A Dictionary of Families and Genera of Chinese Cryptogamic (Spore-Bearing) Plants. Beijing: Higher Education Press. ISBN 978-7-04-028870-4. In Chinese with an English preface and summary. Five major groups of living organisms are covered in the Dictionary of Families and Genera of Chinese Cryptogamic (Spore-Bearing) Plants. These groups include 1) algae with 679 genera of 206 families, 2) fungi with 1278 genera of 232 families, 3) lichens with 209 genera of 71 families, 4) bryophytes with 541 genera of 119 families, and 5) ferns with 223 genera of 62 families. Each entry in the dictionary deals with a single family or genus. 3620 entries are included and arranged alphabetically. Descriptions are provided for each family or genus together with information about its habitat, distribution in China as well as in the world at large. Etymology of the name of each genus or family is provided based on available literature and tentative explanations. The known numbers of species for the world and for China are provided for each genus, and information about genera and species of economic importance is stated in brief. The genus type species is listed for all genera if possible. This dictionary is intended to be a reference for 1) biologists who conduct investigations of biological resources and biodiversity, 2) environment biologists, 3) agriculturists, 4) phytochemists, 5) medical workers, 6) workers in forestry, 7) those in the fields of veterinary medicine and animal husbandry, and 8) university and college teachers and students carrying out studies in the above, or related, fields. The dictionary is designed to provide basic data for exploitation and utilization of resources of five major groups of organisms living in China.